This dish was made 2 weeks ago and I was struggling to find the correct English name for this dish, but I knew the Chinese name for it. It is sometimes hard to find the right terminology. 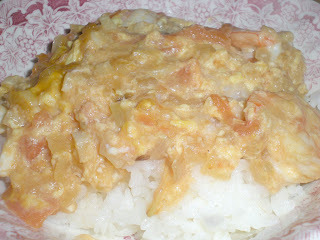 My Taiwanese friend called it "Asian Risotto" and a few food bloggers called it "Jade Rice". I can't figure out why these names should be valid as it doesn't have the texture of a risotto and "jade" might be just a fancy name for such a great dish. Finally, a recent post from Soup Belly made a version of our dish and the name "Egg Sauce" seems to be the most appropriate. My version contains shrimps, tomatoes with wine reduction. 1. In a large skillet, heat oil over medium-high heat. 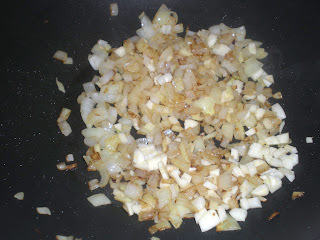 Cook onion until transparent. Add in garlic and ginger until fragrant. 2. 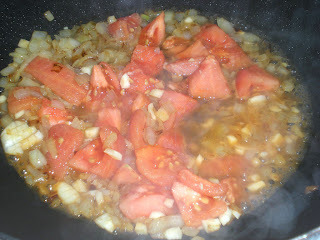 Add tomatoes and wine. Boil and simmer for 15 mins. 3. Add in shrimp and cook for 3-5 mins until it starts turning orange. Season with salt. 4. Make slurry with cornstarch and 1 tbsp water then pour it onto skillet. 5. Turn heat to medium. 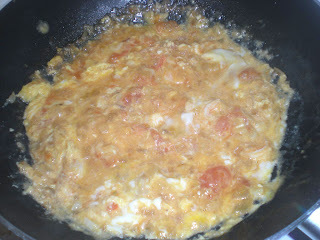 Once boil, turn off and stir in egg until cooked, about 30 seconds. 6. Pour sauce over rice. Serve. 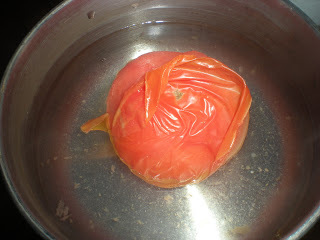 For newbies, here is an interesting way to remove the skin of a tomato. 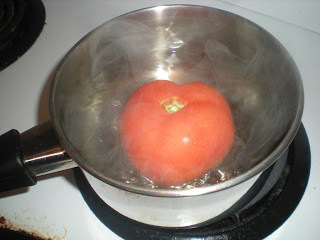 First, start boiling water over medium heat and gently drop the tomato. In less than a minute, the skin starts to detach. Remove with a slotted spoon and remove skin by hand. This is a new one for me, Victor. But it looks darn good! Looks delicious, Can't say that I have had it though!